KawaiiPunk - Kawaii Mascot Blog: Evadelia. Sweet Styles! This, my fine followers of fashion, is the amazingly sweet work of a very talented designer called Evadelia. 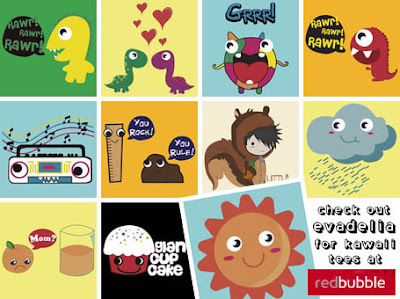 Her colourfully cute work can be found at RedBubble and is just the ticket for shifting those cold January blues. Bunnies, skunks, frogs, birdies, and even monsters can all be found in her fantastic store, and are guaranteed to put a smile on anyone’s face. Even the Grumpy Mascot :) Enjoy! Welcome to The Cute Institute! Snapshot Shenanigans! Unlucky 13 Mascot! Christa de Groot - Oddly Cute!